CHILDISH a new feature in the Mitchell Art Gallery, located on the main floor of Grant MacEwan in Allard Hall, opened to public on September 13th. The gallery is one of the few that allows people to connect with their childish side. All ages are invited to play, explore and create while visiting the gallery without fear of getting into heaps of trouble! This gallery has several unique features including a sand feature by Leisure where visitors have the opportunity to create a piece of art through castings with plaster of Paris. Childish, allows children the opportunity to become part of the exhibit by creating castings and may leave their pieces on display as part of the exhibit. Lore Pasaran, a grade 11 M.E.Lazaerte students creates in the sand feature, using plaster of paris and materials available at the gallery to create pieces of art through casting materials in the sand. 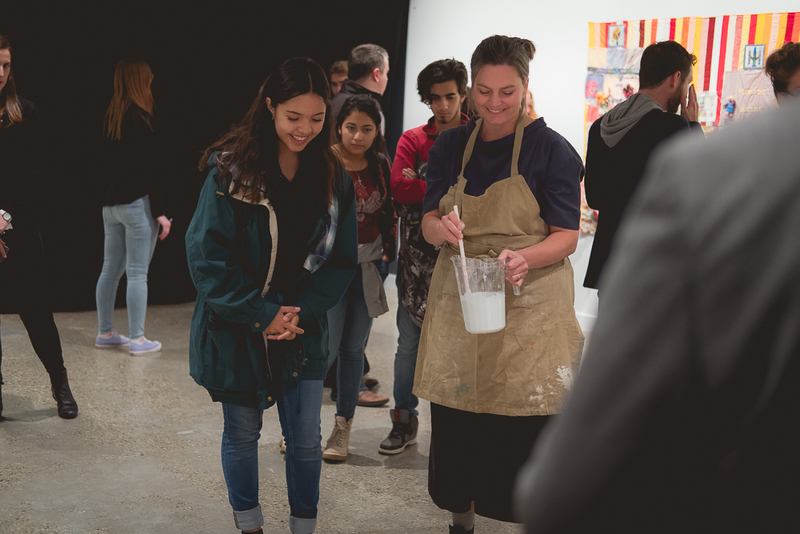 Pictured Above: Artist, Meredith Carruthers invites Lore Pasaran to cast her creation in the sand during the gallery opening night. Mixed Media, titled “A Garden” a collective creation by Richard Boulet, Ariel Boulet and children, Pamela Jones, Bonnie Rathwell, Zed Payne and Anonymous contributors. Stop in to the gallery for the free creative crochet circle as gallery visitors are invited to contribute to the installation by the talented mother-daughter duo Kasie and Mavi Campbell! . The crochet circle is drop in on Thursdays from 3-5pm, no experience and all ages are welcome! CHILDISH will be open to the public from September 13 to December 8, 2018 at the John and Maggie Mitchell Art Gallery during regular gallery hours. Featuring: Richard Boulet, Meagan Byrne, Kasie and Mavi Campbell, Hannah Jickling and Helen Reed, Leisure (Meredith Carruthers and Susannah Wesley), and Joële Walinga and is curated by Carolyn Jervis. The exhibition is open from September 13 - December 8, 2018.